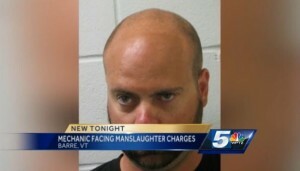 An Vermont mechanic was accused of manslaughter after giving a passing inspection grade to a car involved in a fatal crash, WPTZ reported Wednesday in a story which seems alarmingly relevant to the collision repair industry. Steven Jalbert was arrested Tuesday on suspicion of manslaughter and reckless endangerment related to a crash two months after he examined the vehicle, according to WPTZ. Jalbert, of Barre, Vt., and one of the state’s 5,900 licensed mechanics, has pleaded not guilty, according to the station. The charges carry up to 16 years in prison, WPTZ said. The case seems to carry implications for any auto body shop failing to repair vehicles as directed by the manufacturer — particularly as procedures for structural repairs change with new materials. The allegations also seem to imply that an improper repair can still haunt you even if the customer drives off the lot and doesn’t return to complain. Jalbert allegedly didn’t notice in May 2014 that Elizabeth Ibey’s 1992 Chevrolet Corsica had unsafe, corroded rocker panels and brake lines, WPTZ reported. Ibey, 83, was killed in a crash two months later after the Corsica hit a tree and spun out, according to the station. The Department of Motor Vehicles began investigating after “the driver said the brakes literally gave out,” reporter Hannah McDonald says in a video broadcast posted Wednesday. The mechanic allegedly didn’t even remove a wheel, raise the Corsica on a lift, drive the vehicle or pump the brakes during the inspection, according to the network. Authorities said the Sunoco station where he works was using an out-of-date manual, according to WPTZ.